The photos of the Golden Temple, Amritsar, have always bowled me over with the magnificence and grandeur of the shrine. 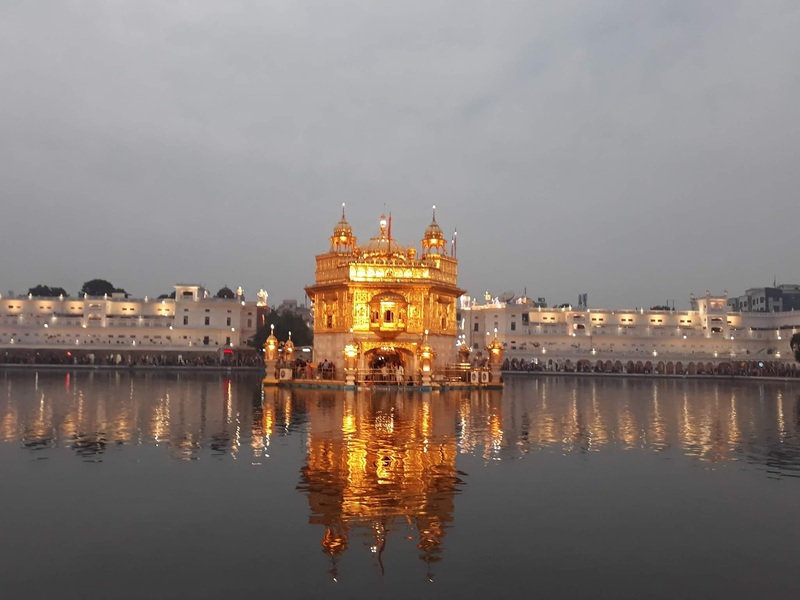 The glitter of gold during the day and its razzle-dazzle at night and the inputs from my friends, have always stirred a desire to visit the place some time. We have always been part of 'conducted group tours' during which we get taken care of, in fact even totally pampered, by the tour company. This being a short trip, we decided to undertake it on our own - just the two of us - my husband and me. First we chose the dates - in November - the weather would be cool. 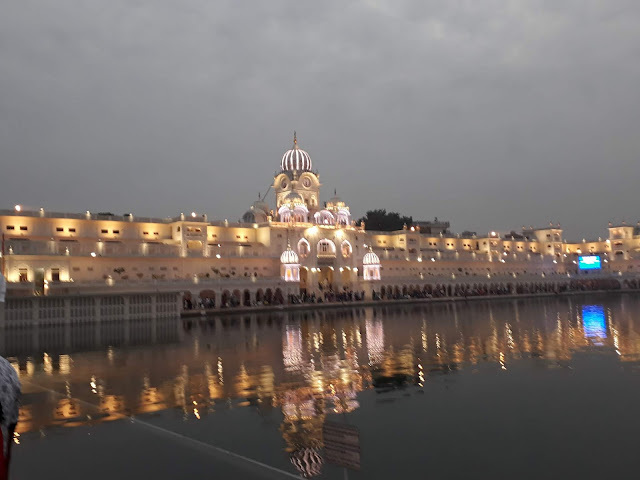 We timed it between Diwali and Guru Nanak Jayanti - so we could escape the thronging crowds. 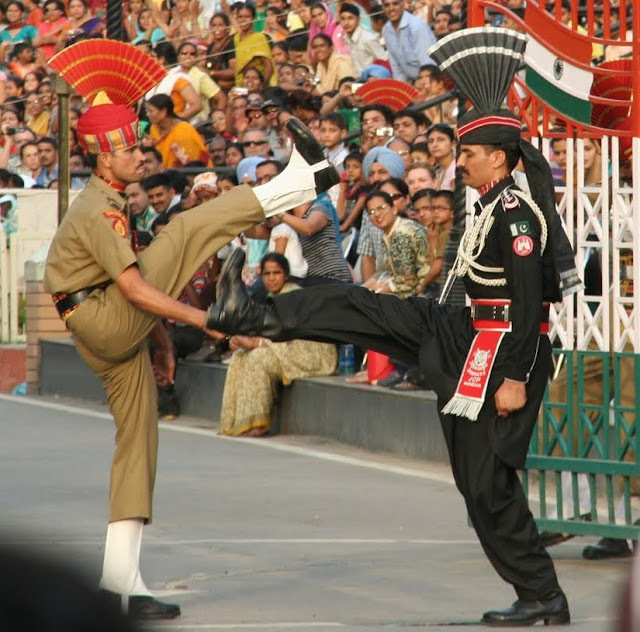 We had three places on our itinerary - Golden Temple, Jallianwala Bagh and Wagah Border. 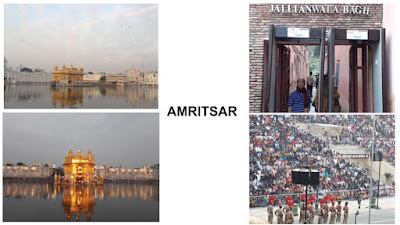 On checking the available flights from Pune to Amritsar, we realized that we could reach Amritsar only in the afternoon - after 1 pm. That being the case, we'd have to spend two nights in Amritsar, as we might not be able to make it to Wagah Border in time on the same day. Next we checked out the hotels online. There were a number of hotels around the Golden Temple, which looked okay. There were a couple of good hotels close to the airport of course. We weighed the pros and cons and decided to choose the former as it would provide easy access to the GT, being at walking distance (8 - 10 minutes). We'd be able to visit the shrine anytime, as many times as we wanted, and also shop around in the shops lined up there. 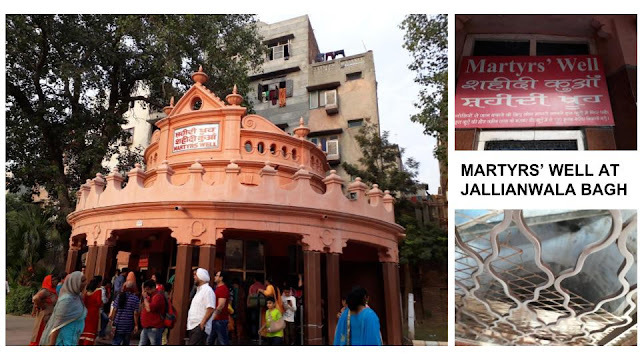 Jallianwala Bagh was just two minutes walk. As for Wagah Border, we could get cabs from GT. 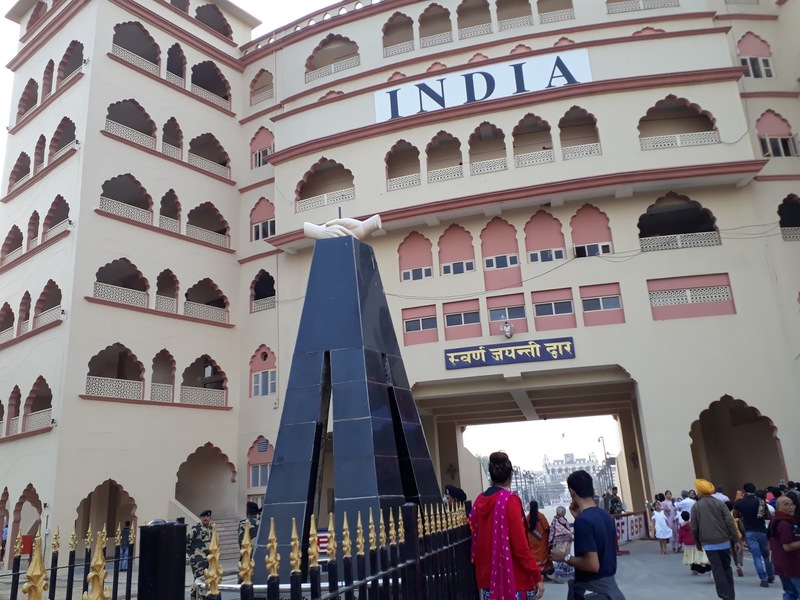 A hotel near the airport would mean a single visit to GT and Jallianwala Bagh, and chilling out in the hotel till leaving for Wagah Border the next afternoon. We picked out a hotel and booked our room for two nights; we also booked our flight tickets. 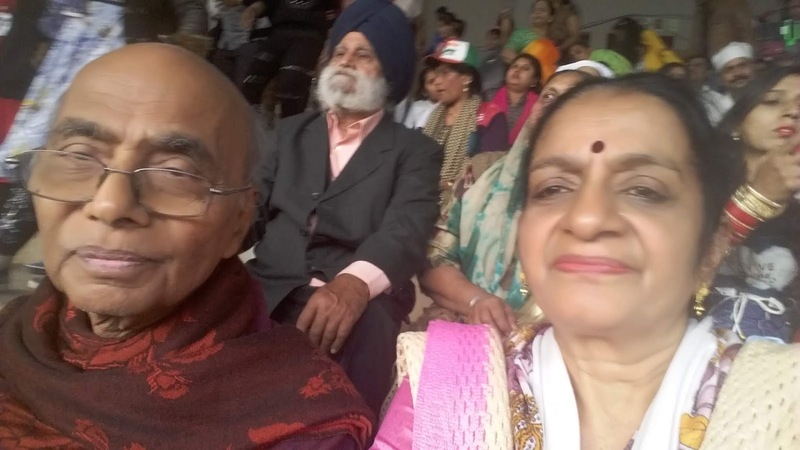 As we awaited the D-day, we got inputs from friends and of course Google uncle about the Golden Temple. 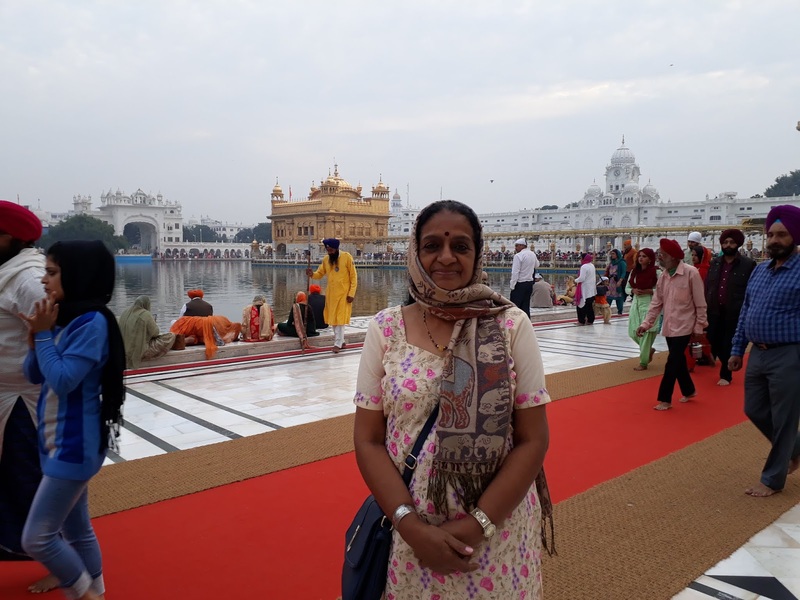 Our friends had described the serenity and peace surrounding the Harmandir Sahib. We were told not to miss the 'langar' food. We landed at Amritsar airport at 1.30 pm. 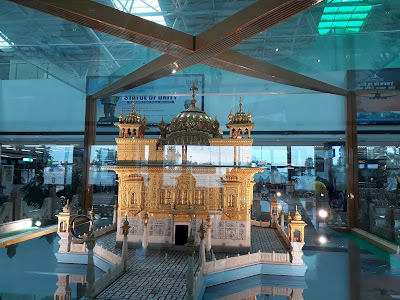 A small, unassuming airport - the highlight was the exhibit of the Golden Temple. We tried Uber but the app was taking time to 'adjust' to the new location. We gave up and walked to the prepaid taxi counter and gave the address of our hotel near GT. We were given a receipt for Rs 700. We had done our homework alright - we were aware that the distance was some 13 km. 700 for that? 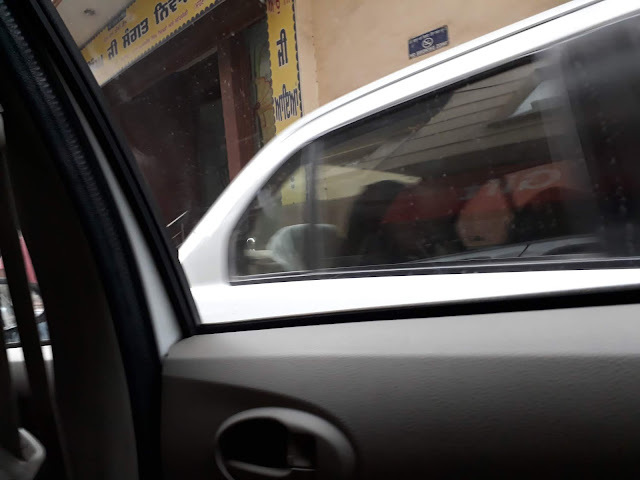 The cab driver was already there and took the receipt from us and took us to his vehicle before we could ask further questions. The taxi was an Innova - a giant car for just two people with just two small roll-ons. We realized our mistake - we should have specified the car - a Wagon R / Indica. Anyway, we decided to enjoy the drive - looking at the autos, cars, cycle-rikshaws, scooters and cycles - many of them, old and actually ready to be dumped at the scrap store. Meanwhile I started talking to the cab driver about our hotel located in GT area. He showed us the receipt and said he was supposed to drop us at the GT parking as mentioned in it. He said we could walk to the hotel, which would just be a few minutes walk. We tried to argue that we were strangers to the place. He explained that the huge vehicle could not take to the narrow lanes. As if we had asked for this jumbo car! Well, we had no option but to take it in our stride. He tried to be helpful by suggesting that we could, for a couple of tenners, take an autorikshaw, which would take a longer route to the hotel. Otherwise we could easily walk and reach the hotel in 10 minutes. He did provide a glimpse of the Punjabi spirit - helpfulness. But we did feel cheated soon after landing in Amritsar - not an encouraging sign - and we were left wondering how the trip would turn out. We started walking from the GT parking lot and inched our way, halting every couple of minutes to inquire directions to 'X' hotel. We also noted the location of Jallianwala Bagh and the entrance to the Golden Temple. The lanes were lined with shops on either side, all sorts of transports and pedestrians jostling one another. We were pretty lucky to locate our hotel without losing our way. Weren't we pleased as punch with ourselves for sailing through this (mis)adventure smoothly! We freshened up and ordered tea. The hot cuppa refreshed us and we were game for our evening's outing at 4.30. 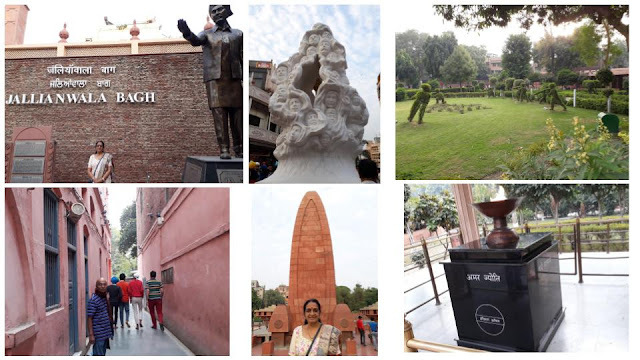 We decided to visit Jallianwala Bagh first. We came out of our hotel, took a left turn, then an immediate right turn, then another left. 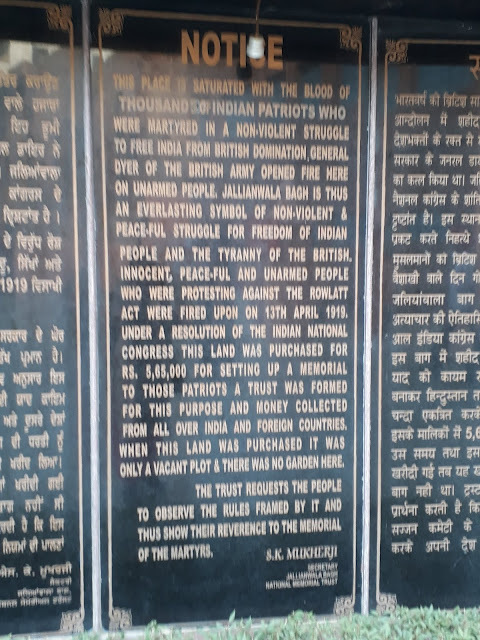 Next we turned to the right for Jallianwala Bagh (the left would lead us to GT). 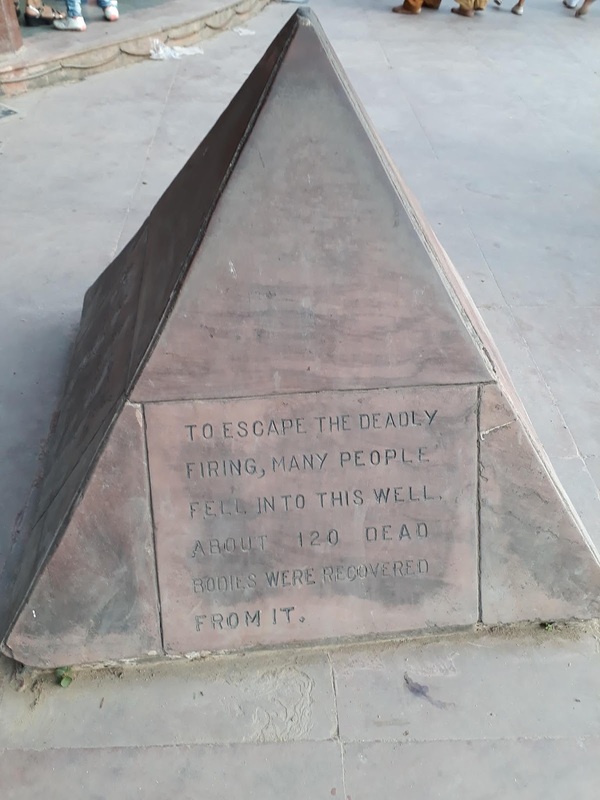 the memorial erected for the martyrs. A plaque at the place mentions that 120 bodies were recovered from the well. As we read the notice at the memorial, we went back to history to that fateful day in 1919 .... 13 April, the day of the traditional festival of 'Baisakhi'. Colonel Reginald Dyer along with several city officials, proceeded through the city, announcing a curfew beginning at 20:00 that night and a ban on all processions and public meetings of four or more persons. 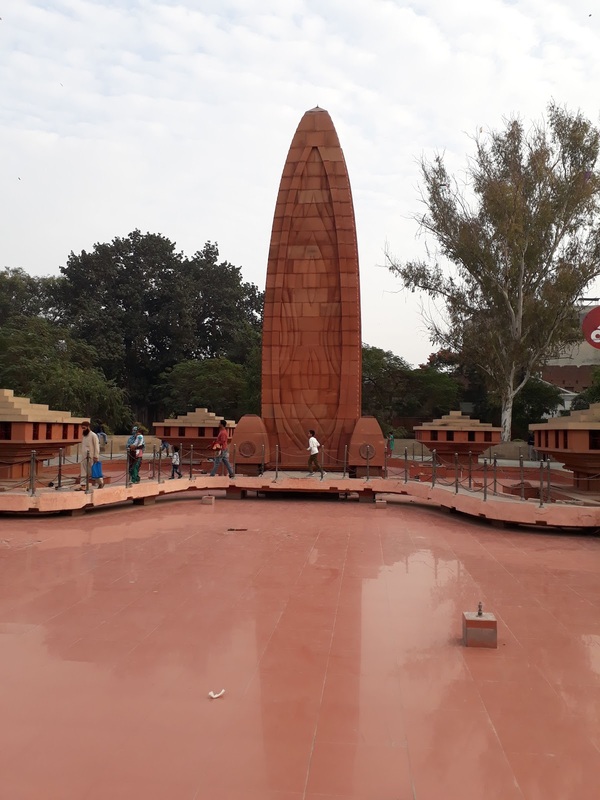 The proclamation was apparently read and explained in English, Urdu, Hindi and Punjabi, but few paid heed and planned a meeting at 4.30 pm in the Jallianwala Bagh. Col Dyer who was informed of this, planned his counter move. 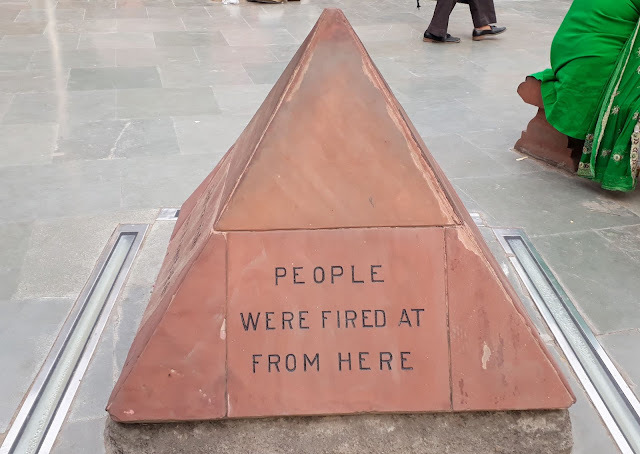 By mid-afternoon, thousands of Sikhs, Muslims and Hindus had gathered in the Jallianwala Bagh (garden) near the Harmandir Sahib in Amritsar. 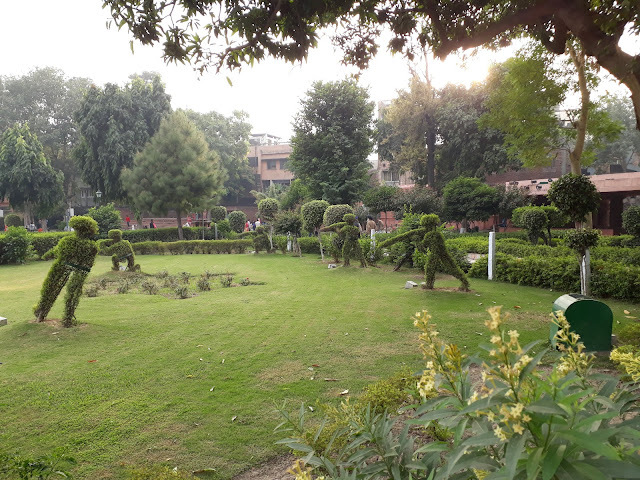 The sprawling Bagh, with five narrow entrances opening onto it - several with locked gates, was surrounded by 10 feet high walls. There was also a 'samadhi' (cremation site) and a large well (some 20 feet in diameter), partly filled with water. 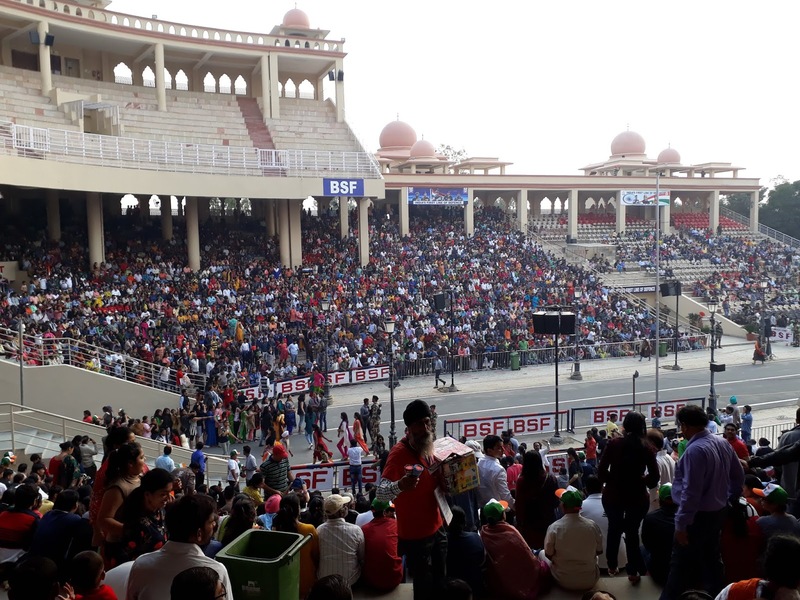 Pilgrims as well as farmers, traders and merchants attending the annual Baisakhi horse and cattle fair, were in the Bagh. 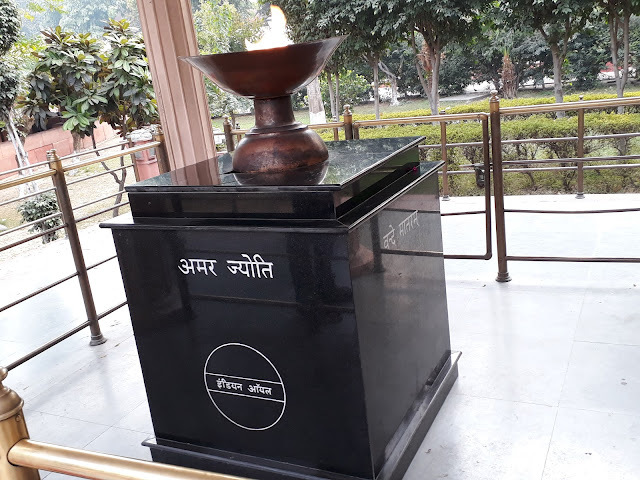 The meeting began as scheduled at 16:30, Colonel Dyer arrived at the Bagh an hour later, with a group of ninety Sikh, Gurkha, Baluchi soldiers, and without warning the crowd to disperse, blocked the main exits and ordered his troops to begin shooting toward the densest sections of the crowd. 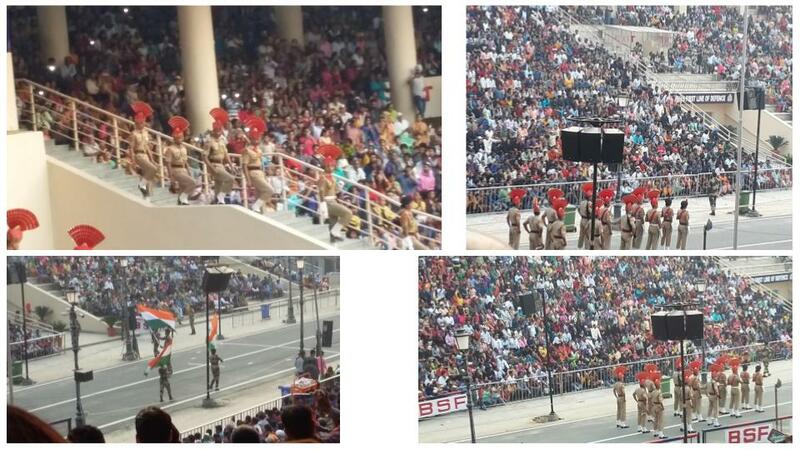 An estimated crowd of 10,000 - 20,000 had assembled there! So we can imagine the pandemonium ..... Cease-fire was ordered only after 10 minutes, when ammunition supplies were almost exhausted, after approximately 1,650 rounds were spent! Many people died in stampedes at the narrow gates ..... The wounded could not be moved from where they had fallen, as a curfew had been declared, and many more died during the night. Many had jumped into the solitary well on the compound to escape the shooting. It was with a heavy heart that we left Jallianwala Bagh and started walking towards the Golden Temple. As we entered, we removed our socks and shoes and handed them at one of the numerous counters and took our tokens and also noted the number of our counter. We then covered our heads. Those who needed, could pick up the reusable 'triangular piece of orange cloth' available at the baskets at the entrance. Before entering, it is mandatory to wash our feet in the flowing water at the gate. If you feel your feet are clean enough and you are in no mood to wet it, you will be spotted by the hawk-eyed security, who will send you to wade through the water. No cheating please, no - you are in a place of worship, you better follow the rules. 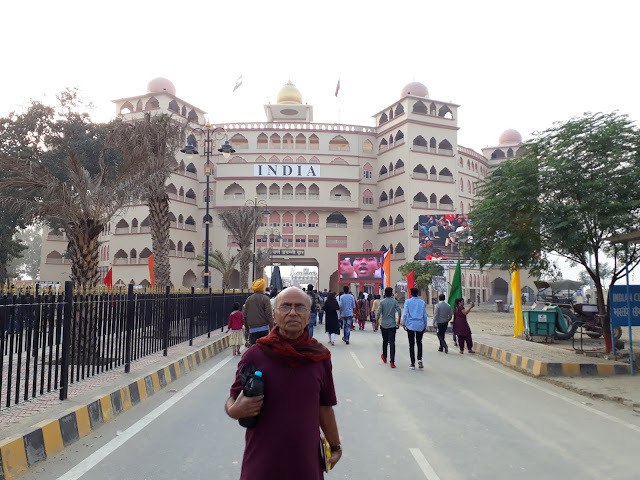 Then we started walking around - along with the large number of devotees .... As the place was sprawling, there was no jostling or pushing. There is an orange carpet, flanked by jute carpets all around the perimeter. Those who did not want to walk on them, could walk on the tiles. In spite of the thronging devotees, it was admirable that the whole area was spotlessly clean. 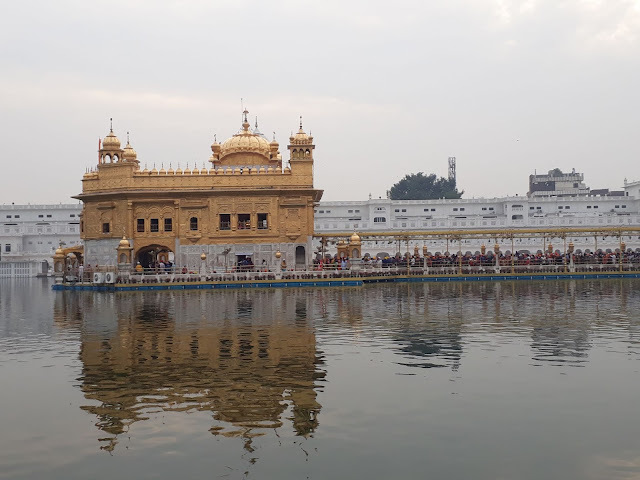 The temple built around a man-made pool ('sarovar'), was completed by Guru Ram Das in 1577. 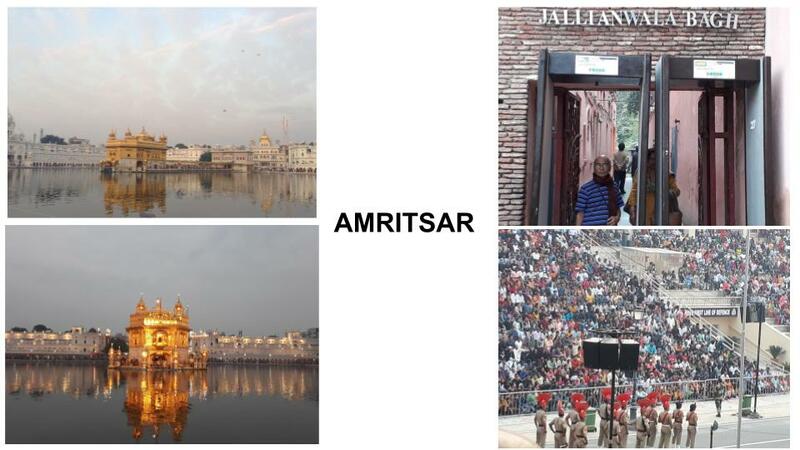 Unfortunately it was destroyed several times by the Muslim armies from Afghanistan and the Mughal Empire and it was repeatedly rebuilt by the Sikhs every time. Maharaja Ranjit Singh after founding the Sikh Empire, rebuilt it in marble and copper in 1809, and overlaid the sanctum with gold foil in 1830 which led to the name, the Golden Temple. The Golden Temple and Akal Takht were occupied by various militant groups in early 1980's. In December 1983, the Sikh political party Akali Dal's President Harcharan Singh Longowal had invited Jarnail Singh Bhindranwale to take up residence in the Golden Temple complex. The Bhindranwale led group started a militant movement seeking to create a new nation Khalistan; it had begun building bunkers and observations posts in and around the Golden Temple. 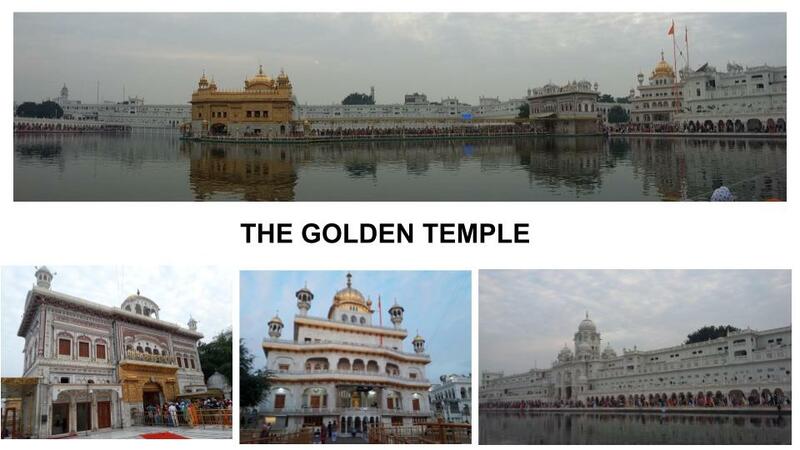 In short the Golden Temple became a place for weapons- training for the militants. In June 1984, Prime Minister Indira Gandhi ordered the Indian Army to begin 'Operation Blue Star' against the militants. The operation caused severe damage and destruction to the Akal Takht and over 1000 soldiers, civilians and militants were killed. Within days of 'Operation Bluestar', some 2000 Sikh soldiers rose in mutiny and attempted to reach Amritsar to liberate the Golden Temple. Within six months, on 31 October 1984, Indira Gandhi's Sikh bodyguards assassinated her. The temple complex was rebuilt again after the 1984 damage. Standing there now, we couldn't imagine such terrorist activities could have taken place at that complex! Everything looked so serene, peaceful, and calm, with thousands of pious devotees moving around in total discipline. The sun set before 6. Now the complex dazzled with all the lights - the Harmandir Sahib in golden yellow lights juxtaposed against the silver lights of the surrounding buildings, highlighted with violet lights. a clock tower, offices, a Museum and a 'langar', which is a free Sikh-community-run kitchen serving a simple vegetarian meal to all visitors without discrimination. The temple complex has been nominated as a UNESCO World Heritage Site, and its application is pending on the tentative list of UNESCO. We could see the long queue at the Harmandir Sahib. As we were tired after a long day, we decided to go inside the sanctum sanctorum early next morning. 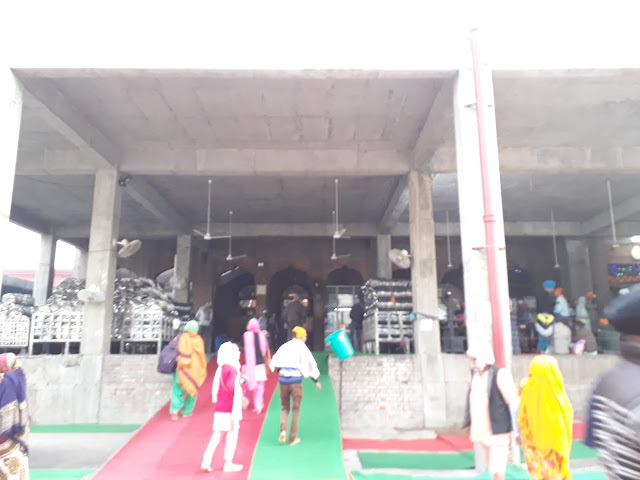 We walked towards the Guru Ram Das Langar, a community-run free kitchen and two dining halls, with a combined seating capacity of 5000. Simple vegetarian food is served to all visitors who want it, regardless of faith, gender or economic background, and all people eat together as equals. 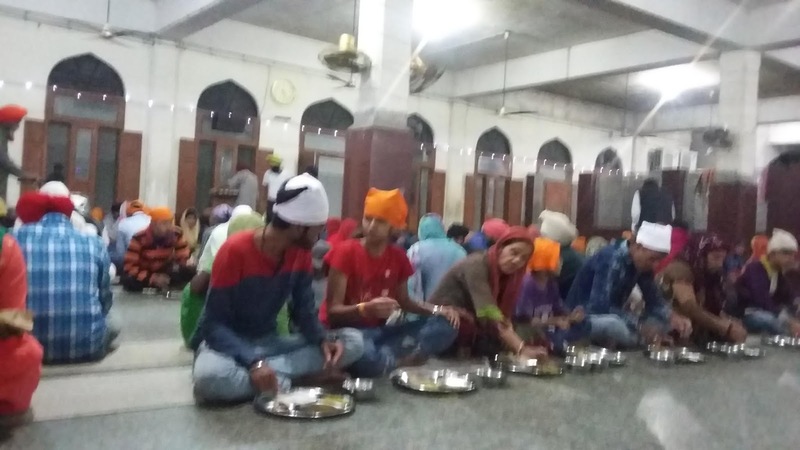 Everyone sits on the floor in rows, which is called 'pangat', and meal is served by volunteers round the clock. As we walked up, we collected our steel plate, spoon and bowl. Then we entered the huge dining hall, where several long rows of mats beckoned us. food was served by volunteers - piping hot 'dal makhni' (lentils), and 'kheer' (porridge). As the 'rotis' came, each of us had to raise our hands and accept it with all humility and gratitude. Water came in a separate mini tanker which was pushed around pouring water in each of our bowls. And the food was unlimited. 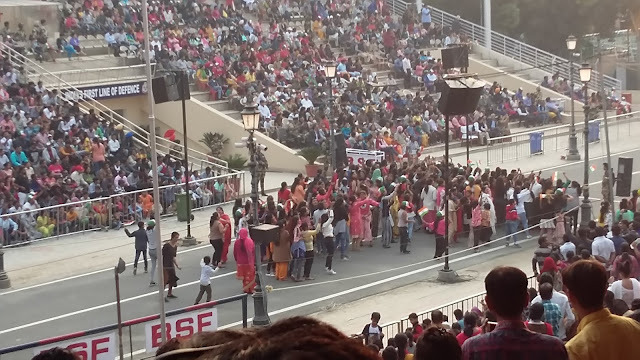 Everyone starts eating only after hearing the loud proclamation, "Jo bole so nihal" "Sat siri akal". As we started relishing the tasty wholesome food, I was thanking my stars that we came just in time, otherwise we'd have had to end up waiting. But no, I was wrong. Nobody had to wait - the system was so smooth that by the time the last row got filled, the first row would have got vacated, as they would have finished their meal! Perfect system and discipline everywhere; cleanliness and hygiene were the mantras. After the meal, all of us had to take our own plates and hand them over to the 'sevaks' waiting for them outside the hall, who would separate the spoon and bowl and send them for washing by another set of 'sevaks', who'd wash them well five times. As we went to wash our hands, what impressed us was that even the hand-wash area was neat and dry. Haven't we seen such areas wet and dirty even in the best of marriage halls? How could such a neat and tidy atmosphere be maintained at a place where an estimated 100,000 people visit daily for worship? Incredible! There are no words to describe our awe for this service. We walked back to the counter to collect our footwear and walked back to our hotel room. The next morning we were up at 4 and got out of the hotel before 5 am, hoping to be the first few in the line at the Harmandir Sahib. Ha ha, who'd have got up so early? 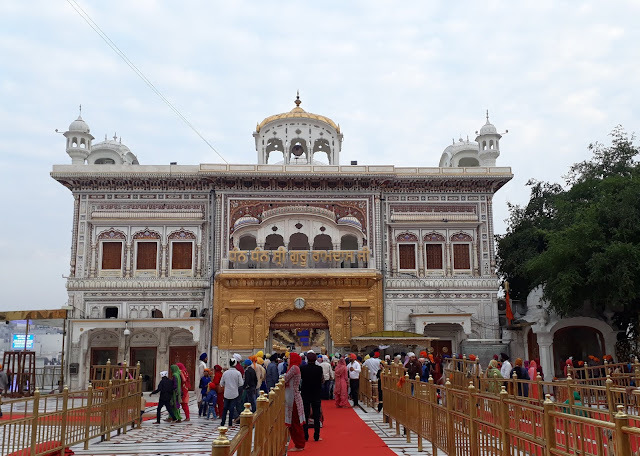 As we entered the temple complex after the ritual of depositing our footwear, covering our head, and washing our feet, we first focused our attention at the Harmandir Sahib. We couldn't believe our eyes - the queue extended till the outer gate! 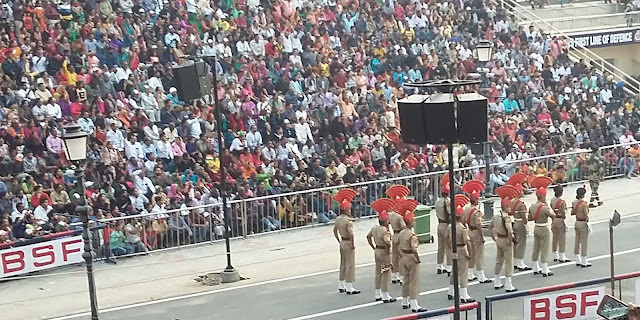 We joined the queue, anticipating a wait of an hour and patiently inched our way along with the disciplined crowd, even as soothing hymns were playing in the background adding to the sanctity of the atmosphere. 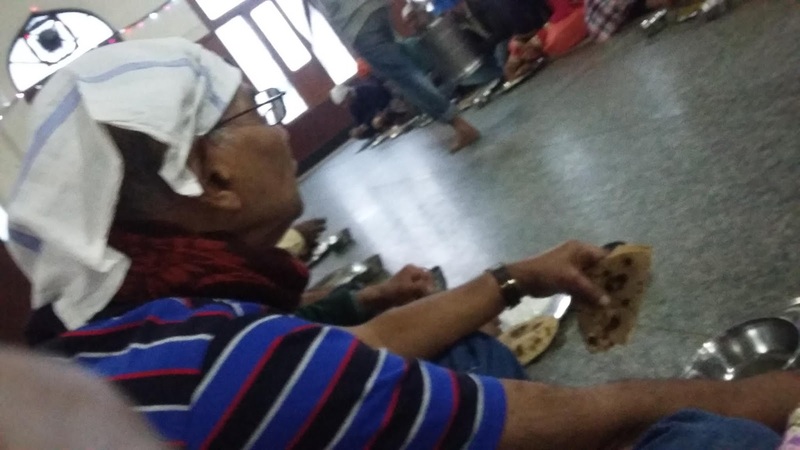 We got to witness the patience, tolerance, and humane nature of the devotees. 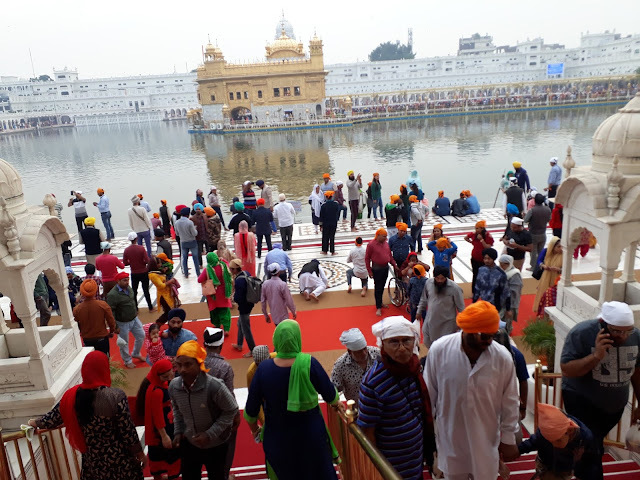 Old people, and children along with their parents, had the privilege of wading their way through the crowd, uttering, 'wahe guru'. Nobody objected; nor were there any dirty looks! Truly we haven't seen a more disciplined crowd anywhere else. In one hour, we got to enter the sanctum, which has two floors. Photography is prohibited here. The Sikh Scripture Guru Granth Sahib is seated on the lower square floor on a raised platform, for about 20 hours everyday. For 4 hours, after midnight, it is taken to its bedroom inside Akal Takht with elaborate ceremonies in a 'palki'. The upper floor in the sanctum is a gallery connected by stairs. The ground floor and the path surrounding the sanctum, are lined with white marble. The sanctum's exterior has gilded copper plates. The doors are gold foil covered copper sheets, with motifs of birds and flowers. We took in the placid aura of the place, seated ourselves there for a couple of minutes, and walked out in contentment. 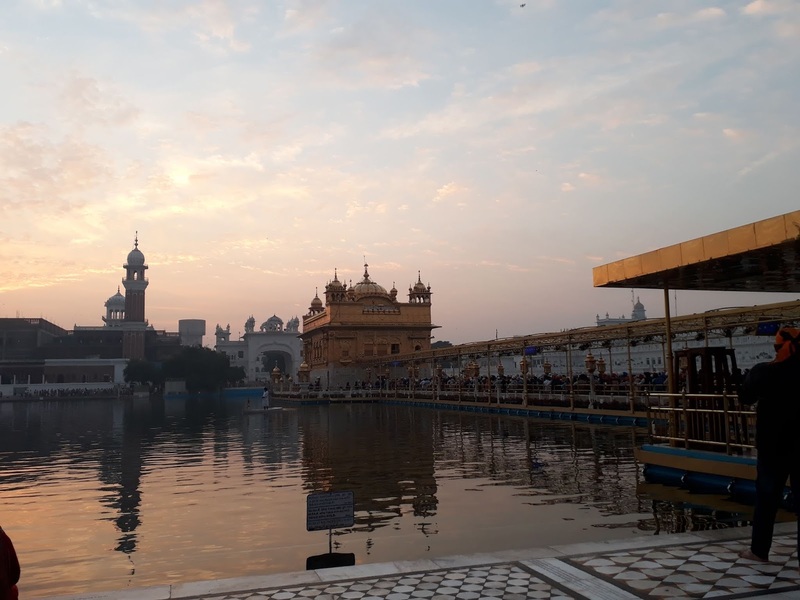 The Harmandir Sahib which is open for all men and women, from all walks of life and faith, has a square plan with four entrances a path around the pool. What sets this shrine apart from others is the discipline and equality. There are no side entrances for privileged VIPs / special 'paid darshan'. There is no 'prasad' for sale. Nowhere in the complex are you expected to pay for anything. You may offer donations if you feel like. We went back to our hotel and after breakfast, rested for a bit. As I wanted to indulge in some little shopping, we again retraced our way to the GT area. That was the advantage of staying in the vicinity - make as many rounds of the Temple and admire it till your heart's content! 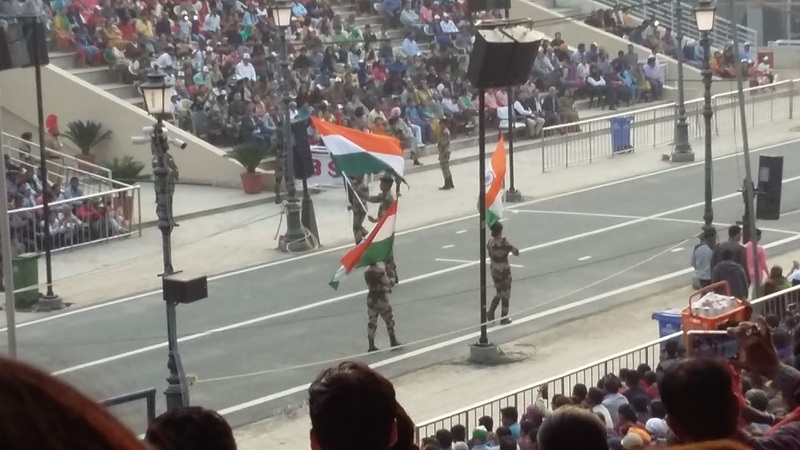 We came across a taxi stand for Wagah Border on the way and booked our vehicle for that afternoon. I picked up some souvenirs from the gift shops at the entrance of the Golden Temple. Some dress material and stoles too got added to my shopping cart. 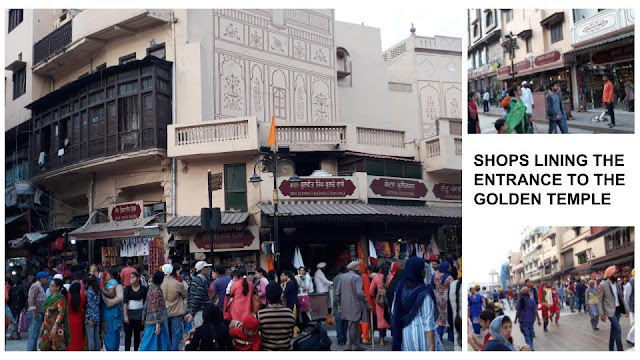 I would have expected these shops to be high-priced, considering their location, but no, the prices were modest and you could indulge in a bit of bargaining. May be the market area would have been even cheaper but I had no qualms that I didn't make it there. I left my packages in the shops to be picked up on our return from the 'langar' after lunch. Before going for lunch, we went to have a peep in the kitchen. On an average day, 70,000 people eat a free meal here and we were informed that some 12,000 kilos of flour is used to make around 2,00,000 rotis. On special days, the automated roti-maker (donated by a Lebanon based devotee), which can roll out 25,000 rotis in an hour, is pressed into service. (Sharing the link to the video of this machine https://youtu.be/GBpoe3jvbCQ ). Otherwise it is the volunteers who roll out the rotis. The rolled out 'roti's pass through giant 'tavas' in batches and get cooked. 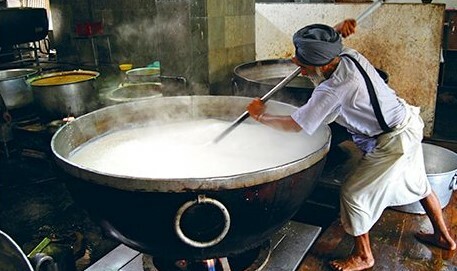 'Dal' and 'kheer' are getting ready in large vessels under the supervision of volunteers. The aroma of spices waft through the kitchen. 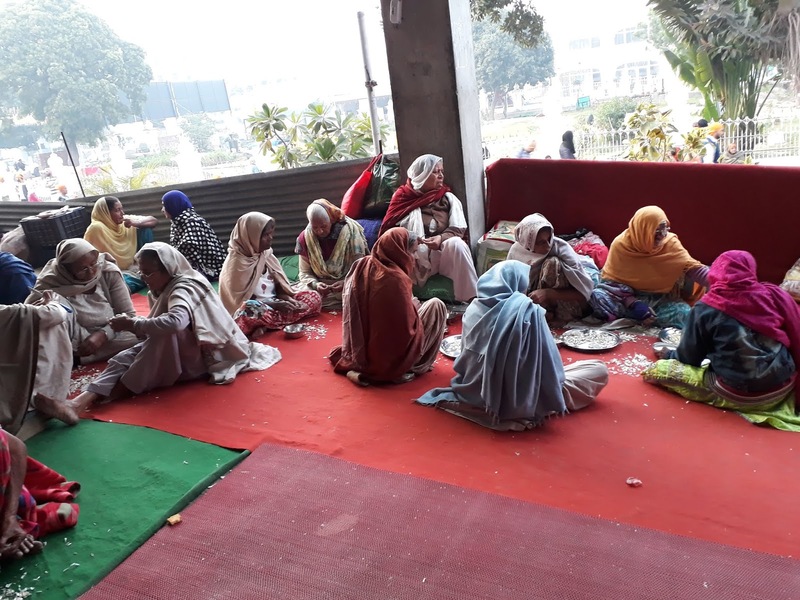 In fact, most of the kitchen work is done by volunteers who peel, chop, cook, and serve the thousands of devotees and tourists, upholding the ideals of community service cherished by Sikhism. Another team of volunteers begins washing the used plates. Still others mop the floors, keeping the kitchen and the two 'langar' halls spotless. In fact 90 % of the work is done by volunteers, as part of their 'kar seva' ethos. Truly admirable! Once again, we enjoyed the experience of 'no-waiting' in queue for the free lunch. Lunch was a more elaborate affair - in addition to 'dal makhni', 'roti', and 'kheer', there was yummy 'chana' (chick peas) and buttermilk. After the hearty meal, we walked back to our hotel, after collecting our purchases from the shops. At 2.15, we started for Attari, Wagah Border in the cab. The drive was expected to take 1 1/4 to 1 3/4 hour for a distance of just 39 km! I felt we would be the early birds reaching there by 3.30 for the show scheduled for 5 pm. 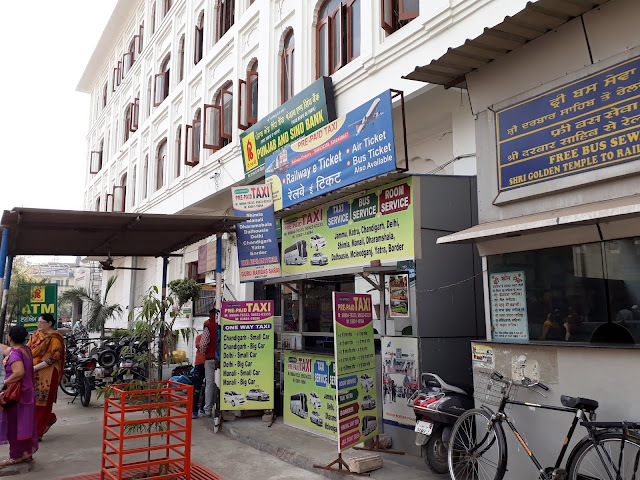 We had just turned the corner of the street of the hotel, when we were confronted with chaotic traffic in the narrow lane. As it was school closure time, there were school buses as well as richshaws, autos, scooterists as well as cyclists plying the kids home, and pedestrians too, adding to the traffic jam. My God! Wasn't I relieved that I wasn't at the steering wheel - I would have torn my hair in desperation. Even then, I sat at the edge of the seat, biting my nails, as I focused on the traffic and how it was being maneuvered - forgetting to click photos, which I deeply regret now. Just for you, I have a photo clicked the next morning during our drive to the airport, when traffic was at its lowest ebb - only to show you how close the vehicles get to each other in the narrow lanes around the Golden Temple. You'd expect frayed tempers and verbal abuses, right? Me too. But you will not believe it when I say everyone was totally unruffled. Why, everyone went out of their way to help manage the traffic, moving not only their own vehicles, but also other parked vehicles, in order to help vehicles squeeze past through the traffic jam. The half hour 'marathon' drive through half a km of traffic-infested narrow lanes was nothing less than an edge-of-the-seat-thriller! 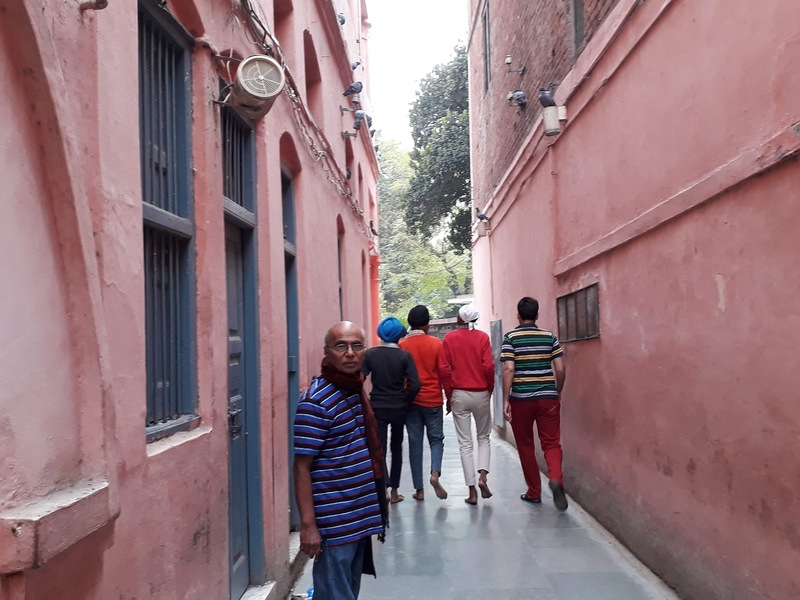 Full marks to my Sikh brethren for their patience, tolerance, amiability, and helpfulness even in stressful moments - they have gone up in my esteem! So, it was almost 3 pm by the time we got on to the main road. 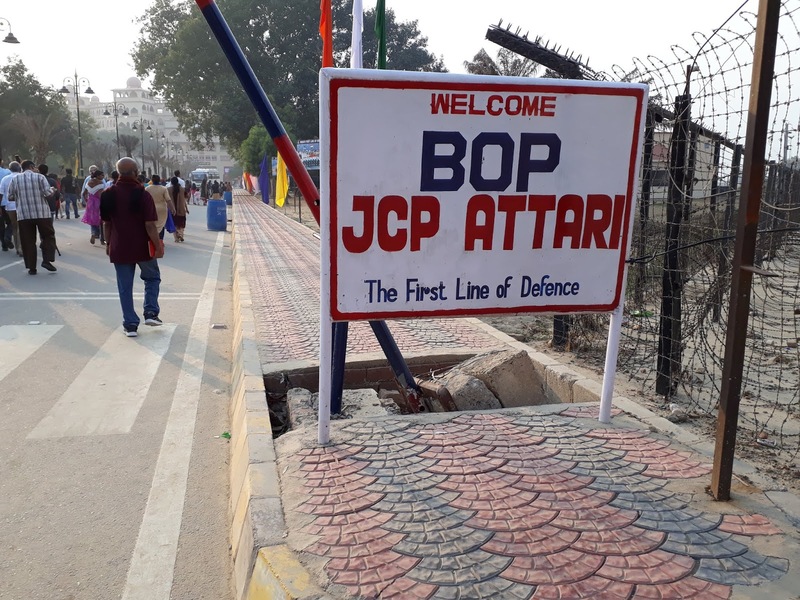 The drive thereafter wasn't bad but when we reached Attari - Wagah Border, it was almost 4 pm - yes we were late by half an hour. As we got out, our driver informed us that we could not take any bags of any size inside. Only mobile phones / cameras / water bottles were allowed. So we had to spend a couple of minutes, transferring our cash / credit card from my handbag to our pockets. As it turned out, a small clutch / a little pouch would be allowed. So be warned, my dear friends; be smart and be prepared. We had to walk one km. There were cycle rikshaws offering to ply you to beat the crowd for Rs 10 / head. But that would save us just a couple of minutes' walk! 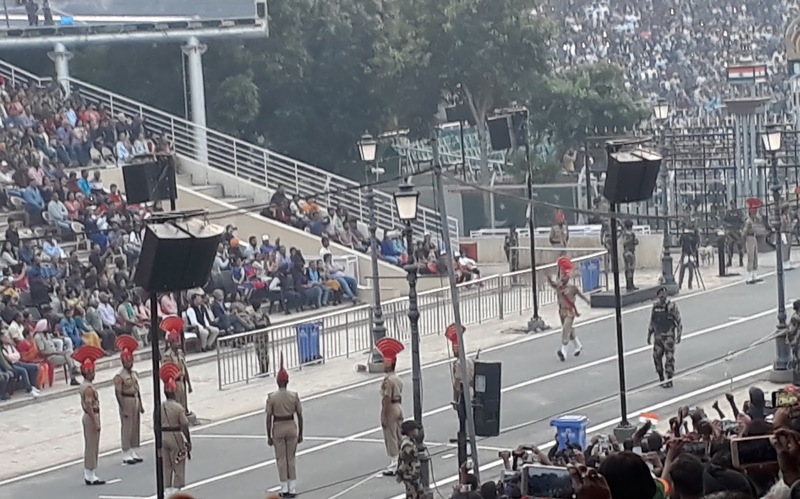 From there, we were on a 'walkathon' for another 12 minutes - we had to literally run to overtake others to occupy decent seats. The entrance was really impressive. Well, when we entered, all the vantage seats had been taken, (curse the traffic jam!). But no worries, we found ourselves a decent spot. Contentment was the key - I had been exposed to that facet in everyone's nature around, in the past two days. We found ourselves good seats and readied ourselves to make the most of our experience - it didn't matter how many were seated in front of us, so long as there were so many sitting behind us! 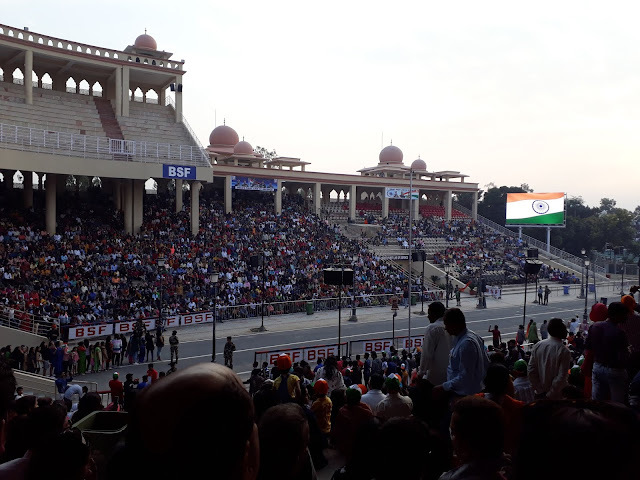 Huge CC TVs projected patriotic scenes; Bollywood songs played in the background and stirred patriotic fervor in the thronging crowd. 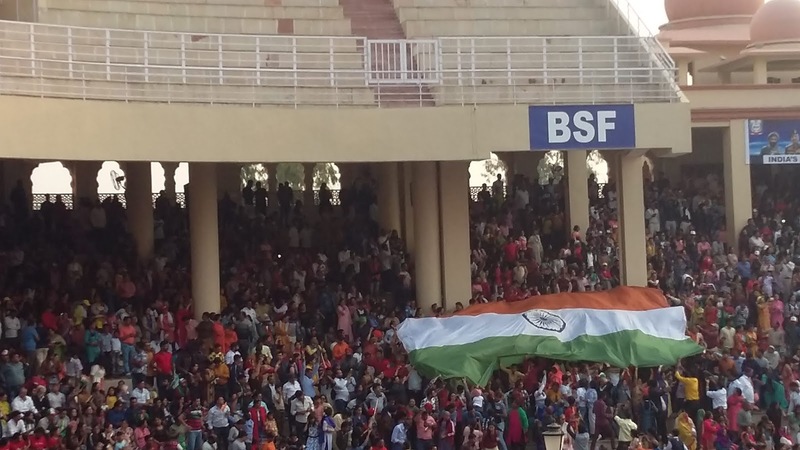 Some started dancing, others marched around bearing the tricolor in hand. As our tricolor, spread out in all its glory, was passed around over the heads of the spectators, shrill cries of 'vande mataram' and 'Bharat mata ki ....Jai' rent the air. On the other side of the gate, we could see our Pakistani counterparts - it gave us a secret thrill to note that the crowd there was not a patch on our side's. Yay! 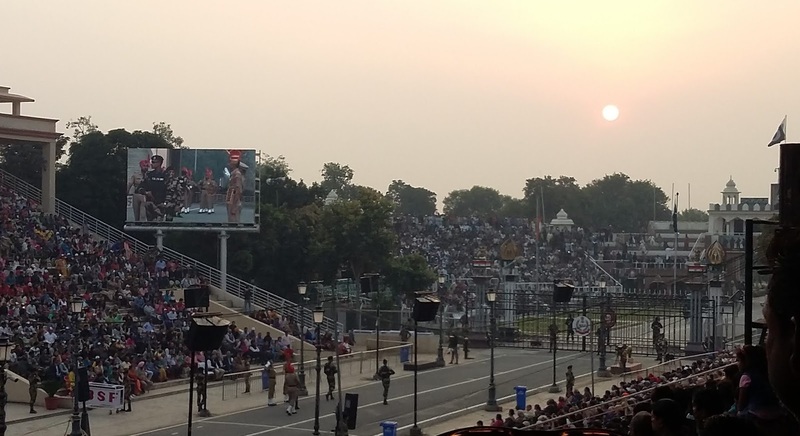 After the patriotic build-up, the actual formal ceremony began at 5 pm, as the sun was getting ready to set. 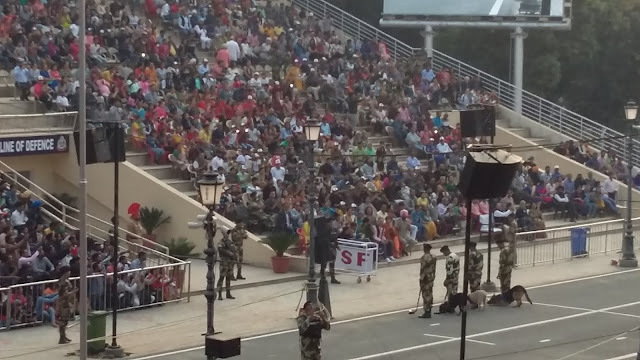 A group of soldiers including women, marched past, with Indian flags. 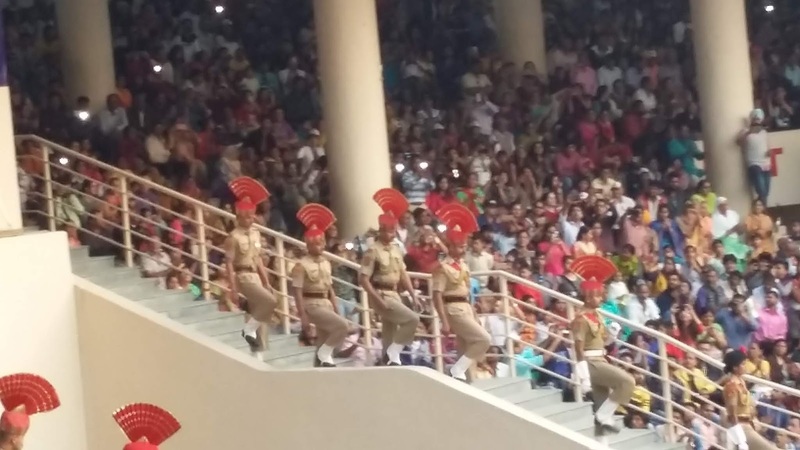 Then a handful of soldiers walked with dogs which bowed to those seated at the VIP stand. Then there were the traditionally attired Indian soldiers of the Border Security Force, in decorative bright red turban, each of who made a loud sound, sustaining it to the maximum and eliciting loud cheers. marched past, as the crowd kept cheering. 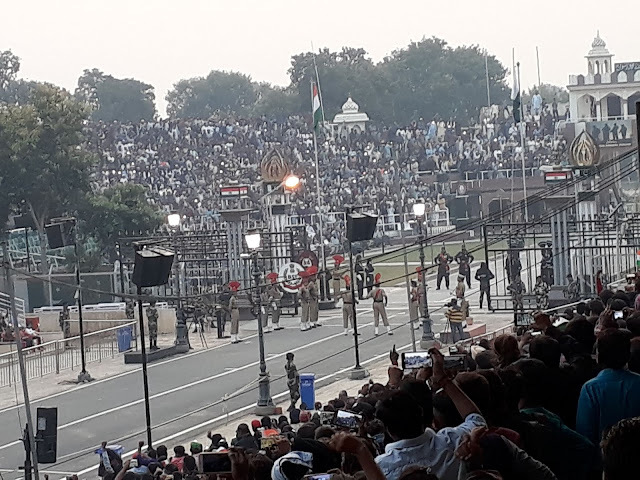 The gates at the Indo - Pak border were opened. One by one, the soldiers marched up to the open gates - their expressions fierce, eyes spitting fire, their legs raised till their forehead as they marched. They'd come face to face with their Pakistani counterpart, breathe fire and challenge, then turn around and march back with the same gusto. Meanwhile armed gunmen stood watching, on either side of the open gates of the Indo-Pak Wagah border. 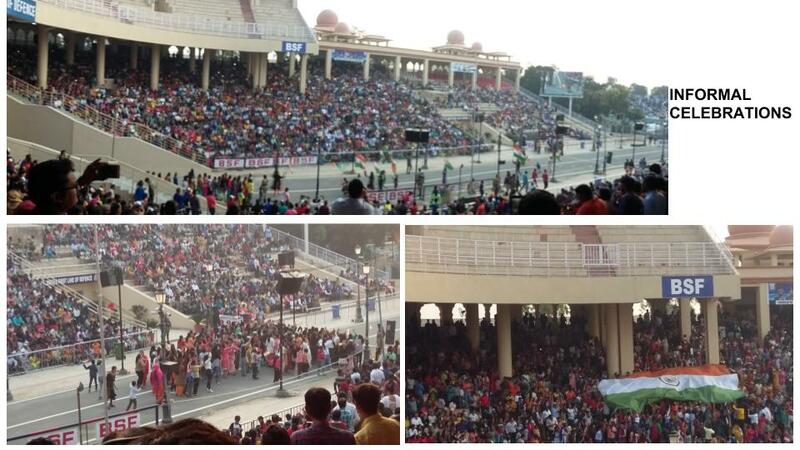 An estimated crowd of around 10,000 had gathered in the stadium on the Indian side of the Wagah border. On the Pakistan side, it was a smaller, subdued crowd. 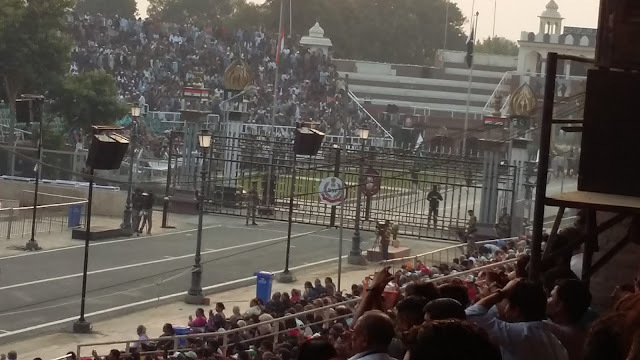 At the end of the half hour show, the Indian flag on our side and the Pakistani flag on the other side of the gate were gradually lowered in sync, then removed, folded and taken back, and the gates were closed for the night. The flags would be hoisted the next morning but there was no public ceremony for that. The swarming crowds walked back to the parking lot to their waiting vehicles - bus / car / auto and returned. We went to our hotel, freshened up and walked to the 'langar' - yes, again - for the third time during our stay. Of course there were modest eateries in and around the place, but their ambiance was not up to the mark. 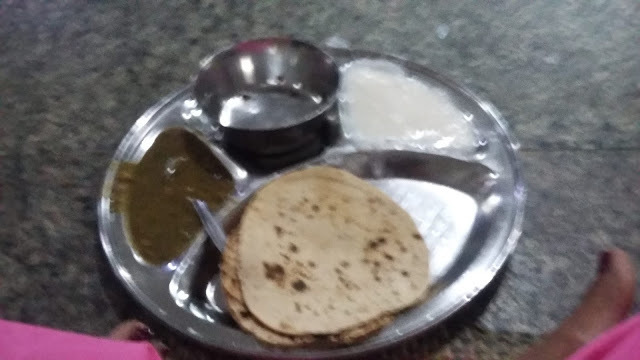 Also the simple hygienic meal served at the 'langar' had weaved its irresistible magic and we were drawn to it. Can you believe me when I say that it took us just 35 minutes to walk to the 'langar', finish our meal, and return to our hotel room? The next day, we were picked up by a prepaid taxi from our hotel itself, as this time, we had asked for a smaller car, an Indica. The rate was the same - Rs 700. So we were convinced there was no cheating with regard to the taxi fare when we had landed.